Type of works: supply of a two-storey, eight-classroom modular building to rehouse the Humanities Department. With their campus due for redevelopment in the near future is seemed unlikely that Queen Elizabeths Community College in Crediton would receive the necessary funding for a new building on their split-site campus. But, the high performance specialist school with an outstanding Ofsted rating for its sixth form provision is growing so fast that Devon County Council agreed that something had to be done, and quickly, to improve pupil accommodation on the campus. Central Government basic need funding was sought and won for the school, but with the proviso that any new building would have to be relocatable, because of the medium-term plan to completely rebuild the campus. 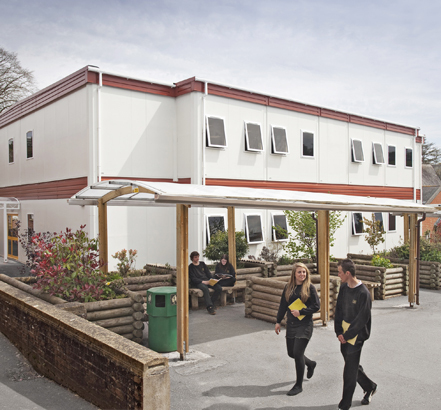 Wernick was commissioned to supply a two storey, eight classroom modular building that would rehouse the Humanities Department. The 28 modular sections that comprise the building were delivered in four days and the building was handed over to the client 13 weeks later. The new building has achieved a very commendable B rating in energy performance. Principal Richard Newton-Chance described the delivery and on-site completion work of the new building as, Completely painless with no time-table changes required and all the groups involved in the project working very well together. The new Humanities block has been delivered in a fraction of the time and cost that traditional construction would have required and although potentially re-locatable provides a standard of pupil accommodation that is superior to anything else that we have at the college.